Old School Ron: Just what is the best way to shuffle? Mana Screw: a term that refers to the condition of either not having enough mana or not having the right color of mana to play the spells in your hand. Mana screw can be the result of several factors: poor luck; an opponent playing a strategy to reduce your mana (such as land destruction and other forms of mana denial); or poor deckbuilding. The lattermost factor can be due to too few lands (or other mana sources), improper colour ratio, or a combination. According to the definition above, it's not about having the wrong colors for me. I've worked that out and I rarely if ever have that issue. We can discount the land destruction strategies as I have no control over my opponent implementing those tactics. Poor deckbuilding... maybe, but I'm pretty confident my land to spells ratio is fine. If anything, I'm a bit heavy on the land at 26 total (including moxes). I think it's shuffling. I can't get my cards mixed well enough to save my life. Almost every single match I am forced to mulligan on more than one occasion. It's enough that it's caught my attention. It's not something that happens every now and then which would be completely understandable, it's every damn time it seems! Short answer... I have no clue. 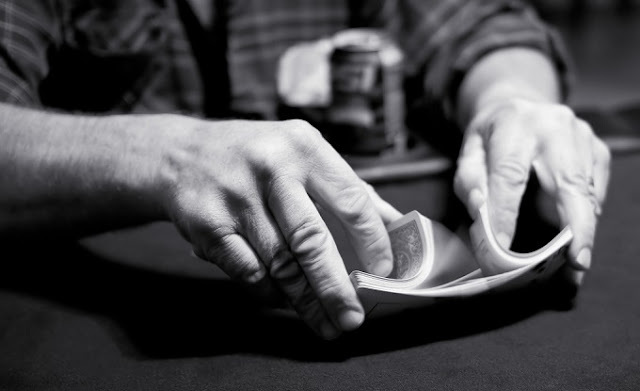 A quick look online will show you any number of ways to shuffle your cards (with sleeves on). Some of these are touted as being far superior than others. Like everything else, opinions are strong and everyone has their own method for making sure their cards are perfectly mixed before a match. Playing without sleeves is not an option. Riffle shuffling seems to be the "best" way to ensure your cards are properly mixed, but that's nearly impossible for me with sleeves on. Maybe with a lot more practice, but right now, that's a complete failure. Right now, my deck is sleeved with Ultra Pro sleeves. I'm using what I understand to be called a "mash shuffle." I cut my deck, hold one half above the other and then push the two halves into each other. I do this eight or nine times and then cut my deck. I'm am curious, what is your preferred method for avoiding the dreaded man screw? Image credit: Stock art found online.